India's telecom sector is abuzz with superb offers. Ever since Reliance Jio has come into the market, incumbent telecom companies including Bharti Airtel, Vodafone, BSNL and Reliance Communications (RCom) seem to be in a hurry to woo customers. 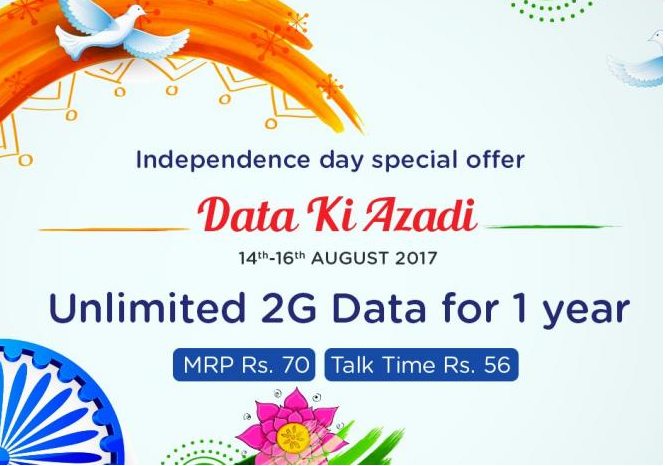 Ahead of the Independence Day, Reliance Mobile has unveiled its ‘Data Ki Azadi’ offer. The plan is offering unlimited 2G data for one year at a price of Rs 70. The talktime credited is for Rs 56. The offer is valid between August 14 and August 16. "Freedom to express the joy of sharing with Reliance’s Data Ki Azadi at Rs.70 unlimited 2G Data for 1 year," Reliance Mobile said in a Twitter post on Monday. Freedom to express the joy of sharing with Reliance’s Data Ki Azadi at Rs.70 unlimited 2G Data for 1 year. Once you click on the link, it directs you to the Reliance Mobile website where you can enter your prepaid number and recharge for the offered amount. Reliance Communications last week posted its third straight quarterly loss as its heavy debt load and a price war triggered by an upstart rival continued to weigh on sales and profit. It reported a net loss of Rs. 1,221 crore ($190.38 million) for the April-June quarter, against a profit of Rs. 54 crore a year earlier. Earlier, Reliance Communication pulled out from membership of industry body AUSPI (Association of Unified Telecom Service Providers of India) raising uncertainty over future of the association, news agency Press Trust of India had reported citing industry sources. RCom sent its letter to AUSPI to withdraw from the membership of the body recently, the agency had cited sources as saying. The reason for the withdrawal of the Anil Ambani-led firm is not known. This development leaves two core members - Tata Teleservices and Sistema Shyam Teleservices (SSTL) - in the industry body. Considering that SSTL is in the process of merging with RCom, the latter's withdrawal from AUSPI pushes it into uncertainty.